Today is the birthday of Alice Guy-Blaché, who was born in France in 1873. You may not have heard of Alice, but she was a pioneer of French cinema. The first female director and writer of narrative fiction films. Alice’s family lived in Chile, where her father owned a publishing company and a chain of book stores. She had four older siblings who were all born in Chile, but they all travelled to France for the birth of their fifth child, Alice Ida Antoinette Guy. She said it was her mother’s last attempt to make sure one of her children was French. After she was born, the rest of the family took off back to Chile, leaving Alice in the care of her grandparents until she was three or four. Then, she too went to live in Chile, where she learned Spanish. At six, she was sent to school in France. Her father’s business collapsed and he died in 1893, leaving Alice to support herself and her mother. She trained as a stenographer and typist, which was then, still quite a new profession. In 1894, she was hired by Léon Gaumont as a secretary for a company working with still photography. The following year, they went bust and Gaumont bought up the equipment and started a new company along with an astronomer called Joseph Vallot and Gustave Eiffel, of tower fame. Gaumont was fascinated by photography and great at building precision instruments. He was very interested in building a device that could both film and project moving images. In March of 1895, he was invited to the Lumière brothers to the screening of their first film: ‘Workers Leaving the Lumière Factory‘. Alice was invited along because she happened to be in the office at the time. Gaumont was disappointed to be beaten, but also began to make his own films. Like the Lumières, his films were everyday scenes: people in the street, trains coming into stations. But Alice saw a different possibility. Alice’s father had been a book seller, she loved books, she loved stories. She didn’t see why a film shouldn’t tell a story too. Alice asked Gaumont for permission to make her own film. He told her yes, as long as she didn’t let her secretarial work drop. Her first film, ‘La Fée aux Choux’, about a woman who grows children in a cabbage patch, was made in 1896. 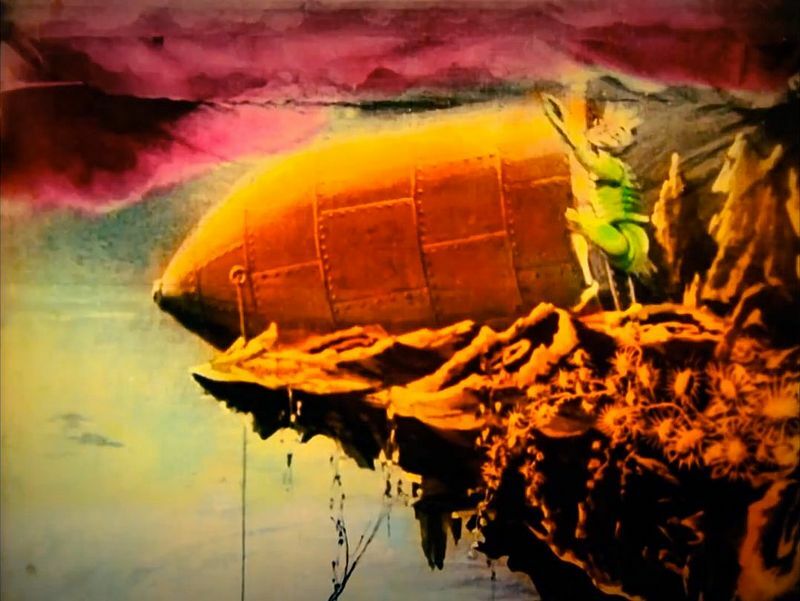 It is a possible contender with the work of Georges Méliès for the first ever narrative film. From then on Alice was made head of production. She not only wrote and directed her own film but also oversaw those filmed by others. Between 1896 and 1906 she was probably the world’s only female film director. She also made travel films and dance films, like this one, which were popular in music halls. Alice used a device invented by Gaumont called ‘Chronophone’, which recorded sound onto a disc along with the film. She used it to produce what might be described as the first music videos. In 1907, Alice married Herbert Blaché who despite his name, was English. She said she wasn’t quite sure, at first, if she wanted to marry an Englishman, because “they are not noted for their joie de vivre”. Shortly after that, they moved to New York where Herbert was to look after Gaumont’s operations in the United States. In 1908, she gave birth to their first daughter and gave up work for a time. She soon missed it though and, in 1910, she set up her own film company, ‘Solax’ with her husband as production manager and cinematographer and herself as artistic director. Despite being, at this time, pregnant with her second child, she was producing between one and three films a week. Her films were very popular and people were delighted to learn that the company was run by a woman. In 1912, she was the only woman to earn $25,000 a year and they built a new studio in New Jersey which was the largest in the US. This was way before people were making films in Hollywood. She said that, at that time, Hollywood was a small town where they had signs on the doors that said ‘no dogs and no actors’. Alice was an innovative film maker. She made film versions of ‘The Hunchback of Notre Dame’ and ‘The Pit and the Pendulum’. People were impressed by her sets, her costumes, her lighting. She used special effects like double exposures, masking and running the film backwards. She always strove to create more spectacular scenes. If a boat needed to be blown up on screen, she didn’t make a little model, she blew up a real boat. But most of all she encouraged her actors to ‘be natural’. Alice directed melodramas comedies, love stories and westerns, but the film I really want to tell you about today was called ‘A Fool and his Money’. It is about a poor man who falls in love with a rich woman but has a rival who is much better off than him, it’s a universal story. But then, he finds a lot of money. He buys himself fancy clothes, spends ostentatiously and throws a huge party where he plans to ask her to marry him. But at the party, his rival cheats him out of all his money in a poker game and he is poor again. What’s particularly interesting about this film is that is features an entirely African American cast. The film was thought lost, but a copy has been recently rediscovered. You can watch a little video about it here. In 1918, her husband left her and ran away to Hollywood with an actress. Alice directed her last film in 1920 and, in 1922, she was forced to sell her studio and move back to France with her children. After that she struggled to provide for them by writing children’s stories and articles for magazines. She never made another film. Alice Guy Blaché wrote, directed and produced around 700 films in her 26 years in the film industry. Her career was longer than that of any other film pioneer, yet most of her work has been lost and her legacy has, until quite recently, been largely forgotten by the industry. She wrote her biography in the 1940s, but it was not published until after her death and not published in English until 1986. If you want to learn more about Alice, there’s a lovely documentary here. There is film footage of Alice herself and it is partially narrated by her granddaughter. Today, I want to tell you about the first Nickelodeon, which opened on this day in 1905 on Smithfield Street in Pittsburgh, Pennsylvania. It was the first venue to be dedicated solely for the showing of film. Previously, films had been shown as part of a programme of entertainment featuring otherwise live performers. Only ten years after the Lumière brothers had projected their first moving pictures, people were growing tired of the medium and the film was often shown at the end of the evening as a signal that it was time to clear the building. Things were, in America, not looking great for cinema. Then two brothers-in-law called Harry Davis and John P Harris decided to open a small store front theatre. Both were already in the entertainment business. Davis was a one time carnival hustler who owned several dime museums, penny arcades and playhouses in the city. Harris and his father ran a company that produced vaudeville shows and had screened Pittsburgh’s first moving picture in 1897. They named their new enterprise ‘Nickelodeon’. ‘Nickel’, because that was how much it cost for a ticket and the ‘odeon’ part came from the Greek word ‘odeion’, which meant enclosed theatre. Their theatrical connections meant they were able to decorate the interior building in an opulent theatrical style, relatively cheaply. They created an atmosphere that most of their clientele could not otherwise hope to experience. Their tiny theatre though, could accommodate only ninety-six people seated on folding chairs with standing room for more. They showed a programme of short films totalling about fifteen minutes in length. They opened at eight o’clock in the morning, closing at midnight. It was incredibly popular. On the first day 450 people turned up, on the second day there were 1,500. soon they had more than 7,000 visitors a day. Their audience were queuing round the block day and night. Opening on Sundays meant that people could also come on their day off. It was such a great idea that loads of people started opening five cent theatres. Four years later, there were 8,000 of them. By 1919 there were 20,000 moving picture houses in the United States. Shortly before the First World War, there were so many cinemas that all those five cents added up to around 150 million dollars a year. In Pittsburgh alone, there were over a hundred five cent cinemas. Film production companies flocked to the city. So did film exchanges, which hired out film reels to the new cinemas. Production companies vied with one another to make more and more elaborate films. That meant that films became longer, which was good for everyone. Distributors were paid according to the length of the film, so they made more money. The cinema owners found it easier because they didn’t have to spend so much time editing a complicated programme of short films and, for film makers, it was a whole new opportunity to experiment with the medium. So, that’s how a multi-million dollar industry was built up, five cents at a time. Not everyone was in favour of the Nickelodeon though. There were those who were not happy about men and women being allowed to spend such a long time sitting together in the dark. Some called for the films to be shown with the lights on, others gathered together to form ‘film review boards’ to judge the morals of the film being shown. There were plenty who concerned that seeing violent films was having a bad influence on children. The Nickelodeon was though, eventually, a victim of it’s own success. As films became longer, ticket prices doubled. That led to the building of larger and more comfortable cinemas. The original Nickelodeon on Smithfield Street was demolished after only five years to make way for a bigger movie theatre. On this day in 1895 the Lumière brothers, Auguste and Louis made their first film. ‘La Sortie de l’Usine Lumière à Lyon’ is a forty-six second film showing workers leaving a factory in Lyons which belonged to their father Charles-Antoine. The Lumières were manufacturers of photographic equipment. Louis had invented a new way of producing photographic plates which was particularly popular and their factory turned out about fifteen million plates a year. This made Antoine a successful business man and, in 1894, he was invited to a demonstration of Edison’s new Peephole Kinetoscope in Paris. He was impressed but he thought it was horrendously expensive. He also felt his sons could do better. There were two basic problems with Edison’s machine. Firstly, it was absolutely enormous and could only be used in a studio. Secondly, it could only be viewed by one person at a time. The Lumière brothers’ film is often referred to as the first ever moving picture, but this is not really true. Louis le Prince, whose work and subsequent mysterious disappearance I mentioned back in October, had filmed his ‘Roundhay Garden Scene’ some seven years earlier. I’ve no idea if the brothers were aware of le Prince’s work, but they certainly built upon the work of other earlier experimenters and their contribution is worth celebrating today too. Within months, they had come up with a machine that could capture images on film, develop them and also project the results. The camera was, compared to Edison’s, lightweight and portable, so they could film anywhere. The addition of a projector meant that they could show their films to a large audience. They called it the ‘cinématograph’. The name cinématograph, they had from another French inventor, Léon Guillaume Bouly, who had also invented a camera that shot, developed and projected film in 1892. It’s hard to say how successful Bouly’s camera was, but by 1894 he was no longer able to keep up the patent and the Lumières bought it. They made one significant improvement. They added perforations to the edges of the film which allowed it to move through the camera much more steadily. Auguste and Louis had the idea of adding perforations from Charles-Émile Reynaud who had made the first animated projected films. In 1877, Reynaud had improved on the zoetrope by adding a circle of mirrors in the centre of the machine. This meant you could view the moving images in the mirrors rather than squinting through a tiny slot in the side. He called it a ‘praxinoscope’. Two years later, he added a glass viewing screen through which you could see the reflection of a background scene. When the moving images were spun into life, they were superimposed against the background. By 1880, he had been able to use lamps to project both background and images onto a screen by using glass plates for his hand-drawn images. In 1888, he patented his ‘Théâtre Optique’ which was on a much grander scale. He abandoned the circular design in favour of using a much longer strip of film which was wound onto a spool. Glass was obviously not suitable, so he painted each image onto squares of gelatin. He fastened them all together with leather strips and added a metal strip with holes between each image. These holes engaged with pins in a revolving wheel and made sure that each image was lined up correctly. Reynaud back projected his images onto a translucent screen and was able to move his film strip backwards and forwards by hand. Although his Théâtre Optique was very popular to begin with, he was quickly overtaken by the Lumières’ Cinématographe. Sadly, little survives of his work because, in a fit of depression, he smashed up his machinery and threw all but two of his picture bands into the Seine. The Lumière brothers films were an immediate and huge success. They had more cameras built and sent them all over the world, to film and to screen what they saw. Most of their films, like Workers Leaving the Factory, were documentary in nature, but they also produced the first comedy film. ‘L’Arroseur arrosé’, the sprinkler sprinkled, shows a gardener watering his garden with a hose. A boy steps on the hose. Gardener looks down hose, boy steps off, gardener gets sprayed in the face. It’s a classic really and probably the first film that might have had some sort of script. You can see it here. Despite this, they really saw no future in narrative film. They thought it was frivolous nonsense and refused to sell a camera to Georges Méliès when he wanted one. In fact, they thought the whole thing would be a bit of a flash in the pan and quickly moved on to other things. In 1903 they patented ‘Autochrome Lumière’, a way of producing colour photographs. The images were on glass plates and could be projected, but it seems they never thought of making colour film. Autochrome photography was still popular up until the 1950s, even though other colour processes had been developed. Film, however, has lasted rather longer. On this day in 1927, Fritz Lang’s film ‘Metropolis’ premièred at the Ufa-Palast am Zoo in Berlin. Metropolis is a hugely important film in the history of science fiction. Unfortunately, as it’s still under copyright, there aren’t a lot of images I can show you. However, I feel almost certain that, even if you haven’t seen it, you’ll have seen stills from it elsewhere. I can show you this robot though and you will probably recognise its influence on C-3PO in Star Wars. Metropolis is set in the year 2026, not so far away now. It shows us an urban dystopia where the rich live in a futuristic city that is powered by workers who toil all day at huge machines and are forced to live underground. I don’t want to spend too long on the plot. It would take a long time and it isn’t really the film’s strong point. Basically, Freder, the son of the man who runs the city falls in love with a working class prophetess, Maria, who wants to bring both sides of the society peacefully together. There’s a bad man, who has the wonderful name of Rotwang, with a robot and he uses it to create a double of Maria, who causes all sorts of trouble. She incites the workers to destroy their machines, which causes their underground city to flood, threatening the lives of their children. Obviously, there’s a lot of stuff about mistaken identity but the right Maria (bad robot Maria) gets burned at the end. The good Maria, Freder and a splendid fellow called Josaphat save all the children and everyone is very sorry, except Rotwang who falls off a roof. Although it is now considered one of the greatest films of the silent era, and pioneering in the genre of science fiction, not everyone shared this opinion at the time. The New York Times called it: “A technical marvel with feet of clay.” HG Wells was similarly unimpressed. He thought Lang had failed to appreciate that the point of machines was to free people from drudgery, not to make their lives harder. He thought it was a silly film. Even Fritz Lang wasn’t that keen on it once it was finished, but there may be other reasons for that. The book on which it was based was written by his then partner, Thea von Harbou, who became, in later years, a very enthusiastic Nazi. Also the Nazis loved the film, which could have been another reason he grew to dislike it. Another triumph was the robot’s costume. It was made over a life cast of the actresses body and, when it was realised that the original plan of using beaten copper would be far too heavy, sculptor Walter Schulze-Mittendorff happened upon plastic wood filler. He found he could roll it flat and drape it over the cast, then cut it to make a sort of armour. He then sprayed it with a mixture of resin and bronze powder. Although it allowed for a little movement, it was still very difficult to wear. Brigitte Helm was terribly scratched and pinched by it, despite many attempts by the stage hands to file down all the sharp edges. People felt so sorry for her that they kept posting coins through the slots in her costume which she used to buy chocolate in the canteen. During the transformation scene, she fainted because it took so long and she couldn’t breathe properly. Brigitte couldn’t really see why it had to be her inside the costume at all, it could be anyone. No one would even know. Lang’s answer was that he would know. Brigitte wasn’t the only one to suffer during the production. It took over a year to film and Lang made them repeat many of the scenes over and over. By the time Gustav Fröhlich, who played Freder, had spent two days throwing himself at the feet of Brigitte, he could barely stand. Spare a thought also for the five hundred child extras, who were from the poorest parts of Berlin. During the scenes when the underground city floods, they spent two weeks struggling in a pool of water that was intentionally kept rather too cold by the director. As for the famous robot transformation scene that was so difficult for Brigitte, it isn’t clear, even now exactly how it was done. The circular lights that move up and down over the robot were not added afterwards, as they would be today, but filmed directly into the camera. It definitely seems to have involved circular neon lights, probably moved up and down with invisible wires, and putting the film through the camera many times. Metropolis is a visually beautiful film, if a little slow by today’s standards. It has been much cut about both to make it shorter and to get rid of some of the elements in the original that were not liked. For example, it was all a bit communist for an American audience. The original cut was thought to be lost, but an uncut version was found in Argentina. It has suffered rather over the years but has been restored and an almost complete version was released in 2010. It’s been interesting to watch this film again knowing about all the inventive techniques and the difficulties everyone had to put up with just to get it made. The actors must have felt, at times, as though they were really living in a city that was ruled over by an uncaring despot. 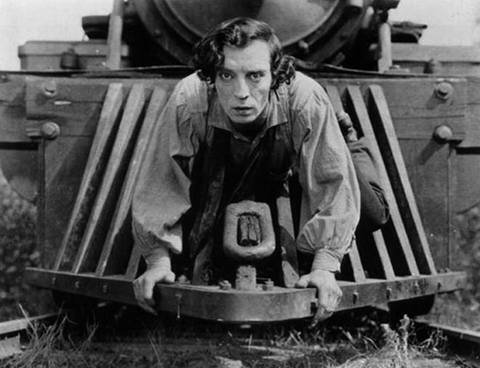 Today is the birthday of Buster Keaton. He was born in 1895 in Piqua, Kansas. He didn’t live there, his parents were just passing through. They were both vaudeville performers and his father, Joe Keaton, was part owner, along with Harry Houdini, of a travelling show called the Mohawk Indian Medicine Company. Buster was christened Joseph, but was given the nickname Buster by Houdini at the age of eighteen months after he fell downstairs without hurting himself. By the age of two, Buster was appearing alongside his parents on stage. By four, he was on a salary and they had become ‘The Three Keatons’. Their act was an extraordinarily violent one. Buster played the part of a child who goaded his father by disobeying him mimicking him and generally getting in his way. In response, his father would kick him all around the stage and throw him against the scenery, into the orchestra pit, even into the audience. Buster had a suitcase handle sewn into the back of his costume to make him easier to throw. By the time he was seven or eight their act was known as ‘The Roughest Act That Was Ever in the History of the Stage.’ There was a great deal of concern about the treatment Buster received on stage and his parents were frequently arrested and accused of child abuse. But Buster had learned how to take a fall and was rarely injured. He was able to show the authorities that he had no bruises or broken bones. In fact he enjoyed being thrown around. He said at first he laughed as his father tossed him through the air, but he soon noticed that this drew fewer laughs from the audience. He got a much better response if he remained stone-faced and stoic about the whole thing. This is probably where he first acquired the deadpan expression for which he was later famous. Although the act was fun for Buster in his childhood, it became less so as he grew older. His father began to drink a great deal which made him volatile and unpredictable both on stage and off. When he was twenty-one he and his mother, Myra, left Joe and moved to New York. Buster worked for a little while on stage in New York, but one day he went along with a friend to Roscoe Arbuckle’s new movie studio on East 48th Street. He immediately landed a part in Roscoe’s film ‘The Butcher Boy’ as ‘man buying molasses’. Straight away Buster was fascinated by everything about film. That night he took one of the cameras home, took it all apart to see how it worked and put in back together again before morning. Buster became part of the regular cast. He made lots of two reelers with Roscoe and soon became co-director with him. In 1920 their producer, Joe Schenck, moved Arbuckle into feature length films and gave Buster his own production unit. He quickly began to make his own feature length films and, although he had a team of writers, the best gags were usually his. His best ideas often involved dangerous stunts which Buster would perform himself. In one of his most famous scenes the entire side of a two story house falls on him. He survives because he is directly below a single open window in the façade. The stunt required him to be standing in exactly the right spot. With only a few inches of clearance on either side, it required precision and nerves of steel. You can see the clip here. He doesn’t even flinch. That façade weighed two tons. His most famous and now most critically acclaimed film ‘The General’ was not especially well received at the time. It was an epic and extremely expensive film which was based on an actual incident during the Civil War. 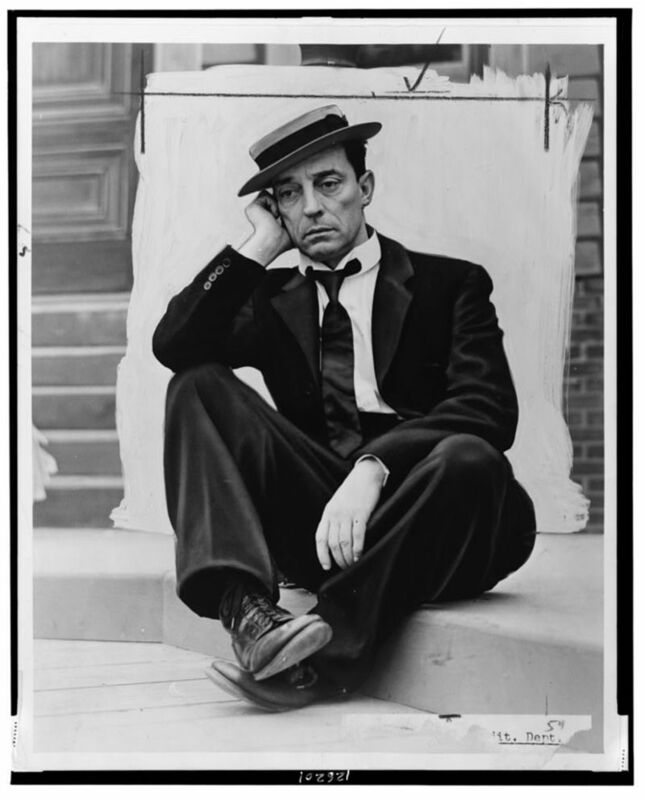 Some thought it was a bit too serious, it was not the lightweight comedy that they had come to expect from Buster Keaton. Others thought that it was a bit off to make a comedy about the Civil War. The mixed reception received by ‘The General’ led to Buster’s loss of artistic control over his films. It was this and the invention of sound that caused him to become deluded. What he had enjoyed about being an independent film maker was the ability to come up with a script that, although it had a definite beginning and end, would be largely ad-libbed. He felt that scenes often lost something when they were rehearsed over and over and often used the rehearsal takes rather than a practised scene in the final cut. Trying to make films under the direction of rigid bosses who were dealing with enormous sums of money and expensive sets was difficult for him. He said: “The minute you’re not flexible that way, the desire to originate and ad-lib, as they call it, is gone. You’ve lost that.” When he signed with MGM in 1928, he was forced to use a stunt double. This was absolutely not what Keaton was about. Much of the joy of his films comes from seeing him attempt something completely reckless and being amazed by that. 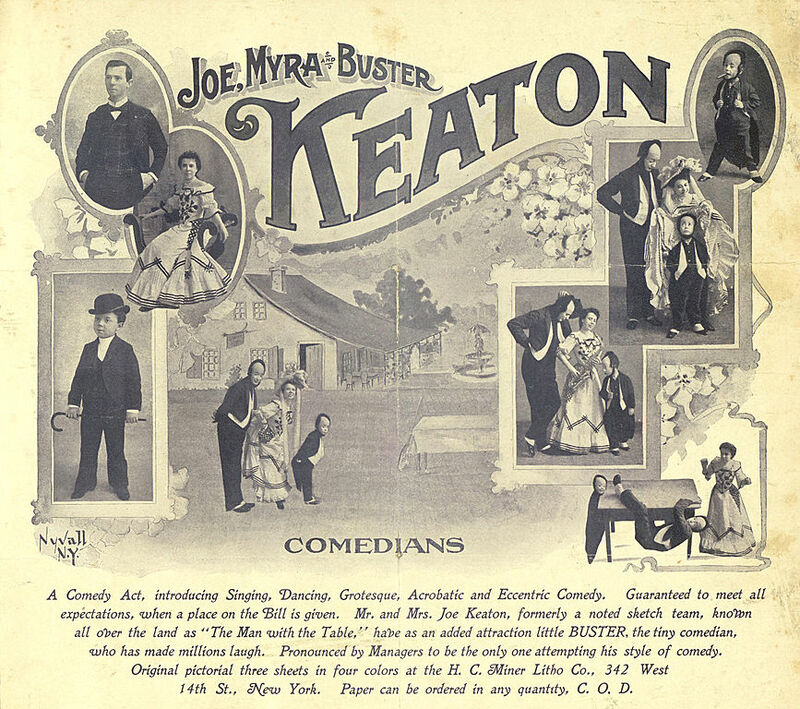 Keaton slid into alcoholism,was sacked by MGM and, in 1935, briefly institutionalised. Here, he reputedly managed to escape from a straitjacket. He was eventually rehired by MGM in 1937 and worked as a gag man but he fell rather into obscurity. In 1952 the actor James Mason moved into Buster’s former Hollywood home and found a secret stash of his films, which were presumed lost. The fragile nitrate films were preserved and interest in his early work was revived. I’m happy to say that he lived long enough to see his genius recognised. ‘The General’ in an excellent film and appears on many lists of All-Time Greats. Any film you’ve ever seen where someone runs over the roof of a moving train owes something to this film. If you haven’t seen it, you definitely should. Failing that, take a look at this short that he made in 1921 called ‘The Goat‘. Go on, it’s only twenty-three minutes. 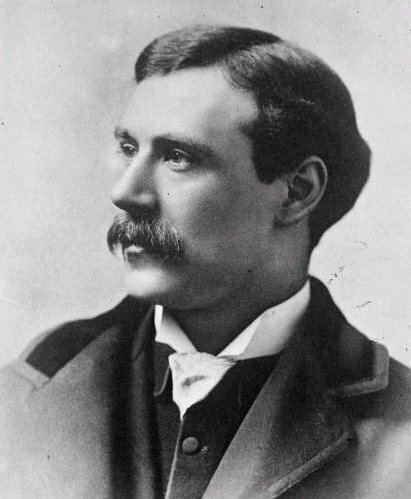 William Friese-Greene was born on this day in 1855. He was a photographer and inventor who is known for his pioneering work in the early days of cinematography. In 1869 he became apprentice to a photographer in Bristol and later opened studios in Bristol, Bath, Plymouth and London. In Bath he met a man named John Arthur Roebuck Rudge who had invented a Magic Lantern that could display seven slides in quick succession, creating the illusion of movement. He called it the Biophantic Lantern. I enjoy a flamboyantly named invention and there are quite a few of them here. Together they began to improve the lantern so that it could project photographic plates. Friese-Greene found glass plates to be an impractical medium for moving pictures and began to experiment with oiled paper and then celluloid. They called the new device the Biophantascope. In 1889 he was issued with a patent for a camera that was capable of taking up to ten photographs per second on celluloid film, his chronophotographic camera. It featured in an article in British Photographic News in 1890. It is not clear whether or not he managed to successfully demonstrate his film. If he did manage to get it to work properly the images would have been very jerky. By this time others had achieved film speeds of twenty frames per second. His later experiments with projecting stereoscopic images also met with limited success. He spent to much time and money on his experiments that he neglected his other businesses and in 1891 he was declared bankrupt. He was forced to sell his patent for the chronphotographic camera and most of his equipment. Friese-Greene was a born inventor and it seems his bankruptcy was no obstacle. He has over seventy patents to his name including inkless printing, electrical transmission of images, x-rays and gyroscopically levelling airships. In 1898 he became obsessed with colour photography. In 1905, after serving a prison sentence for borrowing money whilst being an undischarged bankrupt, he began to experiment with a film system called Biocolour. It produced the illusion of colour by exposing a black and white film through two different coloured filters, frame by frame, alternately red and blue green. Then each developed frame was also stained red or green. The resulting images gave a passable impression of colour but the image flickered quite a lot and suffered from red and green fringing when the subject was in rapid motion. In 1911 William Friese-Greene was taken to court by the inventors of a rival colour process called Kinemacolor. They claimed his work infringed their own patent. William won the case but lost an appeal to the House of Lords in 1914. In 1915 the Lords reversed their decision again but William had not developed his system fully enough to take advantage of it. His son Claude continued to work on the process in the 1920s. Friese-Greene died suddenly after speaking at a meeting about the poor state of the British Film industry. He had just one shilling and ten pence in his pocket. His life was commemorated in a rather awful and over romanticised book and later an even worse film. The film claimed that he was the first to use perforated film which was not true and his reputation suffered because of it. He was obsessed by film and worked hard on his ideas. He was certainly one of the pioneers of early cinema, he just didn’t seem to get anything quite right. Today I am celebrating the 1902 release of the world’s first science fiction film, Le Voyages dans le Lune (A Trip to the Moon) made by Georges Méliès. In the early days of cinema most films were documentaries showing scenes from everyday life. Méliès had strong connections with the theatre which made him interested in making films with a fictional narrative. The plot revolves around a group of astronomers who plan to travel to the moon. They build a bullet shaped capsule and a huge cannon to fire it from. Their landing on the moon is actually shown twice in the film. In the first landing, which is the film’s iconic scene, the Man in the Moon watches them approach and is hit in the eye by their capsule. In the second they land more believably in an imagined lunar landscape. They climb out of their capsule, watch the earth rise then get out blankets and go to sleep. As they sleep, we see in the sky above them, a comet pass by, stars come out, each with a human face, the god Saturn leaning out of a window in his planet and the goddess Phoebe sitting on a crescent moon. She sprinkles snow on them to wake them up. The Astronomers encounter moon dwelling creatures called Selenites who, they discover, disappear in a cloud of smoke when they are thrown to the ground. They kill the moon dwellers king by pulling him from his throne and are chased back to their capsule and return to earth by simply pulling their craft over the edge of a cliff. The capsule plummets through space dragging an angry Selenite behind it and lands in the sea. The film ends with a celebratory parade and a statue dedicated to the chief astronomer. Although the film is short by today’s standards, for 1902 it was an unusually long and lavish production. It took a whole three months to make and most of the ten thousand franc budget went on costumes and mechanical scenery. The astronomers have particularly fine wizard robes in the opening scene and the moon dwellers have quite elaborate insect like costumes. Méliès also uses every camera trick he has in this film. By splicing the film he is able to make telescopes turn into stools and an umbrella into a mushroom. He uses the same technique to make the Selenites disappear in a puff of smoke. For the scene in which the capsule approaches the moon, rather than move the camera towards his subject he sits his actor in a chair and pulls him towards the lens. There is also a double exposure during the return landing in which film of the falling capsule is set against a film of the ocean which was shot on location. Filmed before there was such a thing as a movie star, there are no opening or closing credits. Méliès himself takes the rôle of lead astronomer, the rest of the cast apart from one of the cameramen, are theatrical people. The Selenites are played by the acrobats of the Folies Bergère. Each scene is shot by a single camera which gives the whole thing a very theatrical feel. Méliès has no problem with showing the same scene twice in different ways. In his work there is no such thing as continuity editing and the cinematic vocabulary we would recognise was yet to be built up. At first Méliès had difficulty distributing his film. It’s long running time made it expensive and people were unwilling to pay. According to his memoirs he first got it screened by offering it for free to a fairground exhibitor. It was so popular with fairgoers that he bought the film immediately. It was pronounced a success and ran continuously in Paris for several months. A Trip to the Moon was one of the most popular films of the first few years of the twentieth century. It appeared not only in black and white but also a hand coloured version which was achieved by painstakingly painting each frame of the film. Work which was carried out by Elisabeth Thuillier’s colouring lab in Paris. 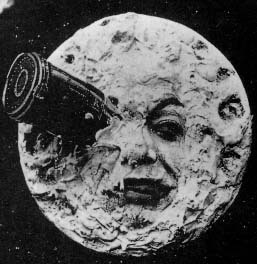 Méliès was keen to distribute in America, where the film also became hugely popular. Sadly he didn’t receive many of the royalties due to him as his film was copied by American distributors such as Edison who did not pay him or even credit him as it’s creator. He is now widely credited as being the first person to recognise the potential of narrative film. In his words: these fantastic and artistic films reproduce stage scenes and create a new genre entirely different from the ordinary cinematographic views of real people and real streets. His work would later influence the work of Edwin S Ported and D W Griffiths who said of him: I owe him everything.